Taste test: Most of the chips in this bag were curly and folded over, with some having brown around the edges. They had a pretty good crunch, but the vinegar flavor was not particularly strong or sharp, and there wasn't a whole lot of potato taste. 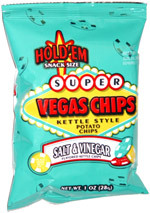 Not a bad flavor, but just not as good as a lot of other vinegar chips we've eaten. Smell test: Just the slightest amount of vinegar.